RICHARD BLAUSTEN, editor of CHARITIES MANAGEMENT, writes: The material on this page is a selection of stories that I think will be of interest to our readers, rather than being instant and comprehensive news coverage. Some of the stories are quite in-depth as I want to give full context. One aspect we like to feature is commitment by corporates to the charity sector as this is a key area of funding for charities. At the same time we seek to publish material on this page which will lead charities to start thinking about how they should be improving the way they operate. It is a process that has to be ongoing. LIFESTYLE GIVING. A really important story on this page concerns lifestyle or passive giving - a company or brand donates as the consumer spends. For example, a supermarket hands out disks at the checkout for the consumer to cast in one or more of a number of boxes indicating a cause. The point is that this passive giving linked to lifestyle spending offers charities a growing potential for extra funding. Charities need to focus on ensuring they are the charity which is the beneficiary when a company or brand decides to commit to a lifestyle or consumer giving scheme. So lifestyle or passive giving should become just as much a fundraising focus as street collections, direct mail, digital promotion, gala dinners, etc. But the list of corporates and brands prepared to commit to this kind of donating is not endless, particularly if economic conditions worsen, so a charity needs to get in there quickly - it is going to get very competitive. SHARING FACILITIES. Similarly orientated charities getting together to share facilities is a necessary response to financial and demand pressures. But it can also be an imaginative way of charities helping each other to deliver a better service. Hence we feature below how a transformational donation from an entrepreneur and philosopher is helping to make this possible in a big way. An annual salary survey carried out by consultancy Croner and NCVO has found that UK charity workers are paid as much as 32% below other sectors nationally, and up to 50% below other sectors in London. The 28th edition of the Charity Rewards survey found that on average executive pay is 30% below other sectors and the cheapest places to employ charity staff are in the West Midlands and Scotland, all of which pay between 10% to 12% below the national median. Although in the 12 months from April 2016 to April 2017 the average increase in basic salary was substantially better than in the public sector, charity workers in support roles were among those who received the lowest increase: just 0.1%. Croner Reward benchmarking expert Clare Parkinson says: "As in previous surveys, pay in the charity sector is well below that of other sectors. Looking at the whole country, pay for chief executives in charities averages £82,423, which is 30% below the all sector median of £166,516. London based charities are paying seriously below the London all-sector average at director and senior executive level, by 31% to 50%." The Charity Rewards survey also shows that: the average UK charity sector salary is £32,673; the increase in basic medium pay in the past 12 months was 3.5%; the highest pay increase for middle managers was 3.9%; the highest paying charitable activity saw earnings of £39,944, 22% above the national average; the highest earnings upward movement was in the arts at 12.6% since 2016. Charity trustees believe corporate donors are becoming more important and that charities should review their governance and approach in order to attract more corporate partners, according to research from OLIM Investment Managers. Trustees cited an inadequate commercial approach (37%) and governance (31%) as the most significant barriers preventing them from raising more corporate money, followed by poor reporting (17%). The research also found that the uncertain economic environment (20%) and a lack of high yielding, attractive investments (20%) are perceived as the biggest challenges facing charities in the next 12 months. Reflecting a desire for stable income in these challenges times, trustees (29%) cited a long term approach to investing as the single most important factor when selecting an investment manager. When considering investments, trustees are focused on results, recognising total return (23%), income (23%) and capital growth (20%) as most essential. 34% of trustees plan to increase their level of digital investment in the next 12 months, with the remainder maintaining current levels. Of that investment, trustees are focused on enhancing cybersecurity (23%), operational software (20%) and websites (17%). Charities see integrity (29%) and a robust organisational structure (26%) as the most important factors for good governance. Regulation and governance requirements (6%), changes to fundraising practices (6%) and complying with data protection rules (6%) were among the lowest perceived threats. Angela Lascelles, co-founder and portfolio manager at OLIM, says: “What has become evident over recent years is that donors, in particular corporate donors, place a greater emphasis on reviewing how efficiently a charity is run. An efficient approach in the charity sector does not mean seeking to maximise financial return, but demonstrating how social return is being maximised on each pound invested or donated. A report from accountancy firm MHA MacIntyre Hudson and the Charity Finance Group based on a survey of trustees has revealed that an awareness of the need for financial governance within charities is not followed up by necessary action. 57% of respondents said that they understood strategic financial governance matters well or very well, with only 12% saying that they had a poor or inadequate understanding. Yet 84% of respondents said that it would be beneficial for their charity to have a better understanding of strategic financial governance matters. The report says this could be linked to the fact that only 16% of respondents always assessed board competency for charity finance skills, with 28% assessing skills sometimes and 30% occasionally. This was compounded by the fact that 47% of respondents never or only occasionally assessed the effectiveness of their financial governance. 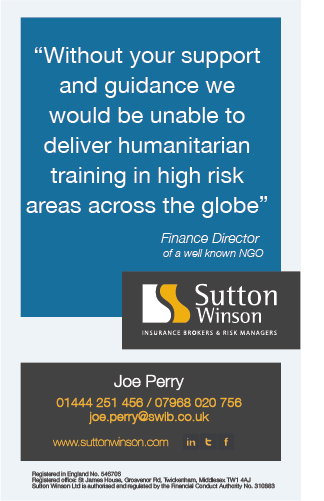 Only 22% of charities indicated that they always made available charity finance training for trustees who needed it. Less than one in five respondents considered that they had the complete skills and knowledge required to fulfil their responsibilities. 49% of respondents said that they had used the latest Charity Commission guidance on charity finance. Accountancy firm RSM’s Funding and Functionality report has highlighted that 72% of larger charities and 62% of smaller charities are spending above 1% of income - the average corporate sector benchmark - on their finance function. On the face of it this looks like a commendable commitment to the finance function. However, says RSM, 40% of these charities are spending over 30% of this on manual transactional processing which highlights that the spend is going into processing time rather than key strategic investment in the team. The survey also shows that almost a third of finance functions are using over 11 spreadsheets to provide regular financial analysis and over three quarters are providing management reporting over 10 days after year end, with a quarter taking over 20 days. The figures uncover inefficiencies across the finance function which RSM argues is leading to excessive processing levels and delays to management reporting. Nick Sladden, head of charities at RSM, says: "An efficient finance function is core to the running of an effective charity; however, many charities seem to be spending a significant amount of income on an inefficient model. Efficiency, or lack of it, doesn’t just come down to monetary costs but using time in areas which add most value to the business. The reliance of manual processing is not only time consuming but it means the finance function has less capacity to input into the strategic direction of the charity." Argues Sladden: "The level of spend could be better invested in innovative technology to automate certain areas of the finance function – bringing increased accuracy, less risk and cost efficiency, plus providing precise, up to date information that will allow charities to be more flexible and nimble when making strategic decisions. Such an approach requires upfront investment but provides savings in the longer term." 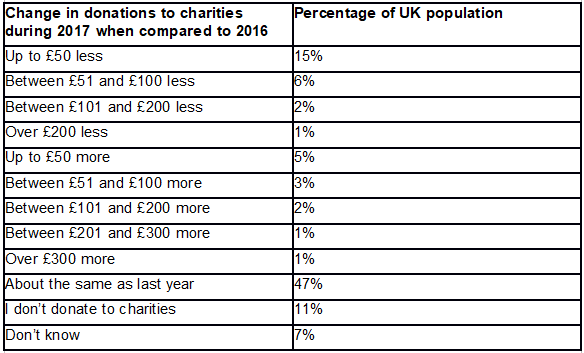 Research from niche bank Cambridge & Counties Bank reveals one in four people (24%) will have donated less to charity in 2017 than in 2016, and only 12% will have given more. Nearly half (47%) will have donated around the same amount as the previous year. When it comes to why they will have donated less, 39% said the main reason was because their disposable income has fallen; 36% said it was down to their cost of living rising; one in four (24%) said it was a result of other personal circumstances changing meaning they have less money. Charities are being urged to get more into lifestyle giving (otherwise known as passive giving), i.e. where companies or brands used by consumers make the donation, e.g. by giving a proportion of the consumer's spend to a cause, or simply making a flat rate donation. The consumer doesn't actually make the donation themselves. 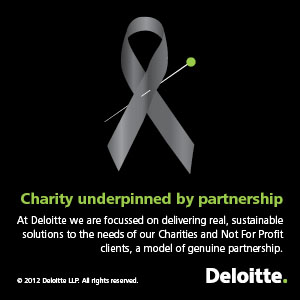 The key though is for a charity to be actually chosen by the company or brand for the scheme. Indeed the charity may have to take the idea to the supplier or provider in the first place. According to online fundraising platform Savoo, this kind of giving is proving very popular among consumers - it has risen 152% since last year. The benefits are obvious. As Savoo points out, as well as being time efficient, lifestyle giving is completely free for the charity and the donor - the fact there are no running costs or admin fees is a big plus as far as both are concerned. Indeed, for those who want to give to charity but simply can't afford to this is a real attraction, and opens up a potentially huge new audience for charities in terms of possible commitment to their cause. While over-60s are more likely to donate to charity than those in their thirties, donor demographics change when it comes to lifestyle giving, certainly the 25-34 age group becomes very important for lifestyle giving. As Savoo points out: "Not only does lifestyle giving allow you to reach a completely new prospective donor base that's younger and typically more internet-savvy, but this in turn allows you to engage with this younger donor base and think about establishing a sense of brand loyalty and a legacy for the future of your charity." Research led by innovation charity Nesta, and delivered in partnership with platform Crowdfunder, has revealed the significant impact that using crowdfunding to match grant funds could have for charity and community projects across the UK. The way in which over £5.6bn of UK grant money is distributed has been slowly evolving. However, crowdfunding platforms have been pioneering matching smaller donations raised from the public with larger institutional funding from 20 local authorities, including Plymouth and Birmingham City Councils, and companies like Santander. The Matched Crowdfunding Report 2017 - the result of a pilot collaboration between the Department for Digital, Culture, Media and Sport, Heritage Lottery Fund, Arts Council England, Crowdfunder and Nesta - shows that grant funds were amplified by 161% by the crowd; 78% of people who pledged gave money they wouldn't ordinarily give to charity or philanthropic causes; 33% saw an uplift in volunteering after the fundraise, with 2 in 3 projects seeing an increase in skills. Phil Geraghty, managing director of Crowdfunder, says: “The previous lack of evidence of the impact that crowd matched funding is having has meant some potential funders have struggled to assess how they could use it within their current funding programmes. However, with the release of this report we now have brand new research that stands as a game changer for the grant sector and crowdfunding. The firm recommendation shining through the report is that this £5bn sector needs to give crowdfunding a go." The Costa Foundation, the charitable arm of Costa Coffee, has begun the development of a new school project in Zambia. The country will be the 10th to benefit from investment, as the Costa Foundation enters its 10th year since its launch in 2007. This is part of an ambitious expansion programme set out by the foundation which aims to raise £20m and complete its 100th school by 2021. This will add to the nearly 30,000 school places which have been created by the Costa Foundation to date. The first phase of the Kasama school in Zambia will open 2018 accepting 200 children. Collaborating with a group of donors, the school will have classrooms, science and IT labs, a kitchen and boarding facilities, and run off renewable energy. It will grow year on year and aim to accommodate up to 1,000 pupils. Kasama in the Northern Province was chosen by the Costa Foundation’s implementing partner PEAS (Promoting Equality in African Schools). Secondary school enrolment is low in the province, the area is under resourced and the quality of education is poor. There are only 10 secondary schools for 15,000 secondary school pupils in Kasama, leading to a sharp drop in enrolment between the end of primary and entry to secondary school. The school will support children in the surrounding area to access secondary school, and is also supporting the local community by providing job opportunities during construction and once the school is open. The Costa Foundation’s mission is to improve the life chances of boys and girls in coffee growing communities by providing them with access to a safe, quality education. Enabling charity partnerships - a transformational £865,000 grant from travel entrepreneur Ken Townsley's foundation is allowing charity Over the Wall to offer its residential camps to other children's charities. Over the Wall, the children’s charity founded by the late Hollywood actor Paul Newman, has been awarded a three year grant worth £865,000 from the Kentown Wizard Foundation. This will be used to transform and expand the services that Over The Wall provides, enabling the charity to double the number of children and families it serves in the UK. It will also allow the charity to expand its reach by targeting and working with various other children's charities, providing residential camps for them and the children they support at less than a third of their full cost. Over the Wall has provided free of charge residential activity camps throughout the UK for children living with serious health challenges, their siblings and families, since 1999. During 2017 the charity has run 13 different camps throughout the UK serving over 660 children and family members. 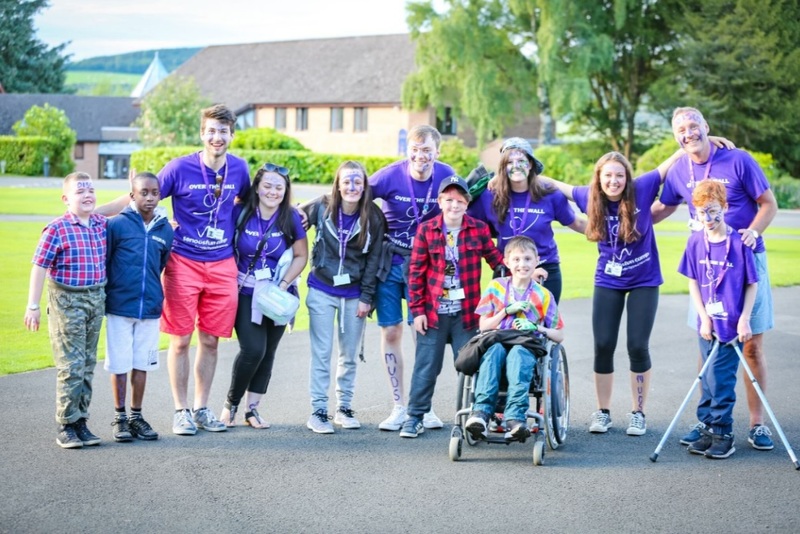 The charity's recent "Outstanding" report from OFSTED stated that while at camp "children and young people forget about their complex medical needs as they become enthralled in a range of activities” and that they “exude confidence and self-belief”. The Kentown Wizard Foundation, a charity dedicated to helping children and young adults living with serious illness or disability, was set up by the travel entrepreneur and philanthropist Ken Townsley, who has donated or pledged in the region of £100 million to the foundation since its launch in 2015. Property company Segro, owner of the Slough Trading Estate, has launched its first Thames Valley Community Fund with £25,000 earmarked for charities and community organisations operating in the Slough, Reading and Bracknell area. Delivered in partnership with the Berkshire Community Foundation, the £25,000 fund will be awarded to projects which will support disadvantaged communities to develop the skills and confidence that will help local people into work. Local charities and grass root community groups are encouraged to apply for a maximum of £5,000 each via the foundation, which is assisting Segro in assessing the applications based against specific criteria of intent, governance and most importantly, how the donation will make a difference to individual lives. Segro has a long history of working with the local community and supporting charities which include Slough Food Bank, the Slough Business Community Partnership and Slough Aspire, which is now in its fourth year. The training and skill centre has enabled over 3,000 local residents to access training to improve their employment opportunities. At a time when the issue of young people's mental health has come to the forefront, a major new fund aimed at helping young people affected by mental health issues has been launched. The Young Minds Matter Programme is the brainchild of Cheshire Community Foundation (CCF), which matches charitable donors with the causes that matter most in Cheshire and Warrington. CCF is putting in place plans for a £500,000 fund to distribute over the next three years. It already has 50% of the funds secured from a number of local donors and is keen to hear from other individuals and companies interested in supporting the programme. Contributions will be match-funded pound for pound (up to £250,000). CCF also wants to hear from organisations which feel their work fits with the programme’s objective of combating mental health issues affecting young people in Cheshire and Warrington. CCF is specifically looking for organisations with plans for longer term projects running for 3 years, although successful applicants will initially receive funding to deliver a pilot project. A joint research project into school children's eating during half term within the context of perceived "holiday hunger" has led to the implementation of practical findings on the motivation of volunteers and subsequent advice on how to manage them. The University of Bristol joined forces with the charity MakeLunch to understand how Christian church groups are responding to the growing problem of children not having enough food to eat during half term, and how best to ensure volunteers remain engaged. Stephanie Denning, an Economic and Social Research Council funded PhD student in the University of Bristol’s School of Geographical Sciences, conducted the research over a three-year period, analysing the experiences of the people who volunteered with a MakeLunch project that she established. Stephanie has since handed over running of the project which continues to operate successfully. The research found that people’s motivations to volunteer ranged from biblical teaching on responding to hunger, through to anger at political reform and wanting to do something active and meaningful in response. Stephanie comments: “A key motivation for volunteers was obviously to respond to children’s holiday hunger, and volunteers needed to feel this was being met, but there was also a hope it would be an enjoyable and rewarding experience. Advice to charities and voluntary groups is to give as much attention to volunteers as to those a project is serving. A sense of enjoyment, satisfaction and feeling appreciated are important for a person to want to continue volunteering. Maintaining a personal relationship with volunteers is as important as volunteer recruitment. The research goes on to point out it is vital volunteers feel appreciated and valued, otherwise it is likely that they will stop volunteering or seek a different opportunity. Understanding volunteers’ motivations, expectations and volunteering experiences will help voluntary groups to develop positive relationships with volunteers and gain their longer term support. 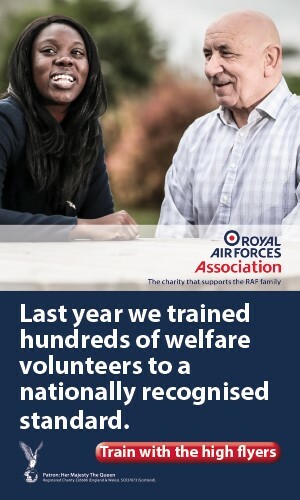 Now that the Royal Air Forces Association's welfare volunteer courses have acquired official recognition, as it rolls them out across its own volunteers nationally it is also offering the same courses to other charities, albeit for a fee. Two of the RAF Association’s welfare volunteer courses have been awarded level one and two accredited status. The association is now the only armed forces charity in the UK to train welfare volunteers to this level of accreditation on the national framework, in the area of befriending and welfare support (i.e. for caseworkers). The charity’s welfare support (caseworker) training course is now accredited at level two, while its befriending course is accredited at level one. This means both courses are nationally recognised and participants receive a qualification approved by the Regulated Qualifications Framework (RQF), the same framework that accredits GCSEs and NVQs. The updated training programme will provide volunteers with the knowledge to support the RAF family and their local community. It teaches them how to support beneficiaries, the best ways to signpost to other help or financial assistance. The association’s welfare volunteers work alongside the welfare officers in branches and regional offices – all of whom are trained to welfare diploma standards. The association believes that its courses have application to volunteers right across the welfare charity sector and so is making them available to other charities for their volunteers. Two studies have been launched to enable leading charities to understand how they can better work with GPs to diagnose and support patients with cancer or long term conditions. Seven charities have backed the collaborative projects that is being run by research consultancy Alterline. The idea is that bringing groups of charities together enables them to address common issues with one voice, share knowledge, learn from each other’s experiences and generate smarter solutions. One study is focusing on patients diagnosed with cancer; this is supported by Beating Bowel Cancer, the Brain Tumour Charity, Roy Castle Lung Cancer Foundation and the Teenage Cancer Trust. The second, focusing on those living with long term conditions, is supported by the British Heart Foundation, Alzheimer’s Society and Arthritis Research UK. Each of the two studies will canvas the views of 200 GPs – using quantitative and qualitative research to identify what GPs need most from healthcare charities and how this can be best be delivered, and how charities can ensure their engagement reduces rather than increases the burden of work for GPs. Field research has begun and the final report will be published by the end of February 2018. Diabetes UK has signed a three-year managed service contract with IT Lab. This will see IT Lab migrate Diabetes UK’s existing infrastructure and applications to its private cloud platform Cloudlab, which will be made available to 400 of the charity's employees across ten UK sites. The IT company will provide ongoing end user support, service management, advanced monitoring and infrastructure support services in conjunction with the charity's internal IT team. In addition to partnering with a leading managed service provider, key criteria in choosing IT Lab was the development of an appropriate operating model and service design which will allow a flexible approach to future technology requirements while delivering world class support services to the entire Diabetes UK team. UK charities are feeling more optimistic about how their investments will perform in the future. However, the level of enthusiasm on the potential for high single digit returns still remains down on levels seen in 2014 and 2015, according to Newton Investment Management's fourth annual Charity Investment Survey. 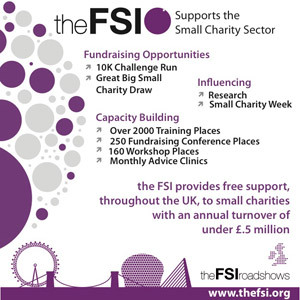 Increased confidence by charities on the long term performance of their investments has seen those expecting annual total returns over 10 years range from a 6%-9% increase from a quarter (25%) in 2016 to almost two fifths (38%) in the latest survey. This coincides with a fall in the number of charities expecting their investments to return 3%-6% per annum over 10 years, from 61% in 2016 to 36% 2017. Newton notes that despite political challenges on the horizon, this long term enthusiasm is also reflected in charities’ outlooks for returns over the medium term. Well over a third of charities (37%) expect their investments to deliver a total return of 6%-9% per annum over the next three to five years. This is another improvement on 2016, when just 17% of charities expected to see this level of returns over the three to five year period. Expectations for portfolios to return 9% or more per annum over a three to five year horizon are the highest in the survey’s history, with 8% of charities believing they will achieve this over the medium term. 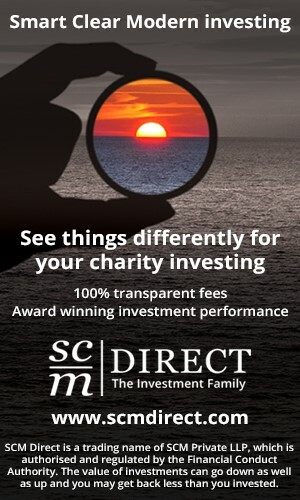 Renewed confidence over potential investment returns appears to be filtering down into what charities deem to be a sustainable withdrawal rate. On average, charities are withdrawing 3% of their investment portfolio to spend on charitable objectives in 2017, very slightly up from 2.9% in 2016. Charities also have heightened expectations of what represents a sustainable rate of withdrawal from their portfolios over the long term, without reducing the real value of their portfolios after inflation. The majority of respondents (53%) suggest that a withdrawal rate of 3%-3.9% is sustainable. The average response given on sustainable withdrawal rates has edged up from 3.3% in 2016 to 3.6% 2017. Charities are more optimistic about the political environment and its impact on their investment portfolios. While the majority (72%) expect Brexit to impact their portfolios, this is lower than in 2016 when 83% expected an impact. A majority of charities expect the impact of Brexit to be negative, both for portfolio capital (73%) and income (81%). Almost two thirds (60%) of respondents, however, feel that Brexit will have no impact or a negligible impact on their charitable works, with beneficiaries, recruitment and fundraising seen as the most likely areas to be affected. The Newton Charity Investment Survey notes that ethical investment remains important for charities. The proportion of charities identifying as ethical investors in 2017 remains around half (51%). Charities remain predominantly committed to actively managed portfolios, with a majority (68%) solely using active strategies rather than passive (index tracking) strategies. Charities with assets under £20m are most likely to use only passive strategies, while those with assets over £500m most likely to blend the use of active and passive strategies. The survey reports that the use of alternative assets (such as property, hedge funds and private equity) by charities as part of their investment portfolios has been broadly stable in 2017, compared with 2016. The vast majority of charities (88%) have expressed satisfaction with the returns delivered by their alternative investments. Women make up 33.8% of the average charity trustee board. This represents an incremental increase from two years ago (31.1%), and compares favourably with the percentage of women on FTSE 100 boards (27.6%). However, 41% of charities still believe there is more to be done to adequately reflect diversity in a holistic sense on trustee boards. According to the survey, 61% of charities believe the regulatory environment has become more challenging. Two thirds of survey respondents noted that the impact of this tougher environment has led to an increase in costs.